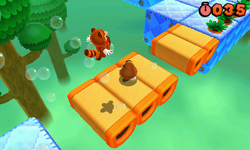 Special 6-2 is the second level of Special 6 in Super Mario 3D Land. It is based off of World 3-3. The player starts out on a platform in front of some Donut Lifts, these lead to a platform that has more Donut Lifts after it. After this, is a large platform with a Donut Lift path after it that leads to a large Donut Lift platform with three Goombas on it. After this platform is a platform that contains a Red Ring, which will spawn five Red Coin which if collected in time will give either a 1-Up Mushroom or a power-up. After this is a Donut Lift path that branches, the path on the left leads to a Star Medal before dropping down to the platform which the other leads to, after this platform is a Donut Lift path that leads to a Warp Box that will lead to the Goal Pole. Star Medal 1: On the large Donut Lift platform before the platform containing the Red Ring. Star Medal 2: On top of some Donut Lifts after a Wall Jump section. Star Medal 3: Floating in the air before the above the Donut Lifts before the Warp Box.